This sample shows how Paris can be used in the logistics industry to produce complex and expensive documents, such as Bills of Lading, on plain paper. Ideal for applications that use expensive pre-printed multi-part paper. Replace costly pre-printed, multi-part carbon paper and print on plain NCR paper on both sides to significantly reduce the cost of production. 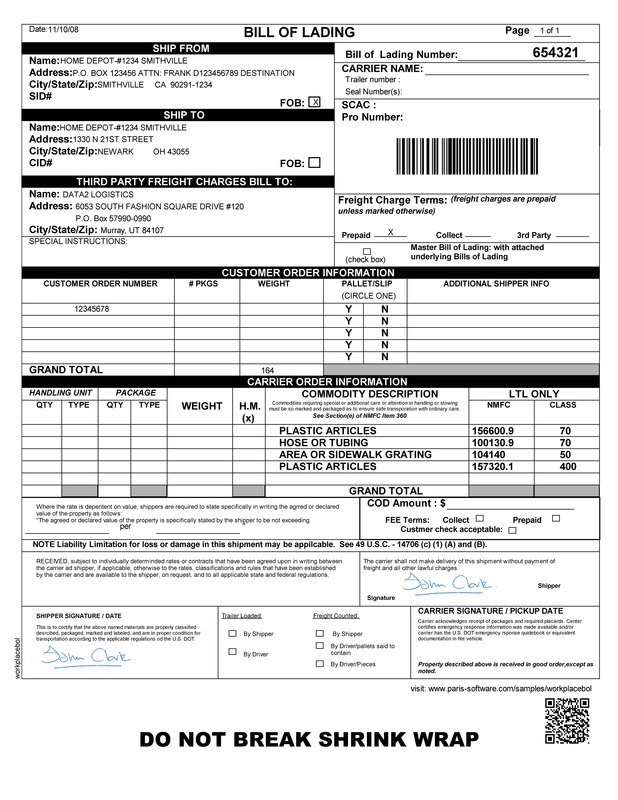 In this example, we are have designed the complex Bill of Lading forms in Paris and then use them to print on plain NCR paper in duplex for the terms and conditions. No changes are required to your host system or process. We are barcoding the main reference number for digital processing and have also included signatures where necessary. NCR paper allows you to print office and customer copies as a set to capture customer signatures on both copies. Interactive PDF objects allow you to tun this in to a completely digital document for electronic capture.